The traditional model of the DOD’s ELOs says that they simply wait for requests from the entertainment industry for production assistance and then review the script and decide whether or not to help. 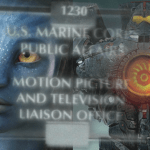 This is how the process is described in the DOD instruction 5410.16 on Assistance to Entertainment-Oriented Motion Picture, Television, and Video Productions. The process is reactive in nature – the DOD are supposed to wait for the entertainment industry to come to them. 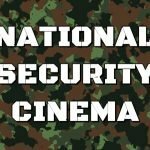 The reality is that the DOD are pro-actively seeking to influence movies at the very earliest stages of production, behaving more like a corporate media conglomerate than a government agency. However, it is clear from the DOD’s own entertainment liaison office reports that they do not adhere to this doctrine, in both small and large ways. Fundamentally, the notion that they are passive, and wait for the entertainment industry to come to them with near-complete projects to ask for minimal assistance is simply untrue. The command in the instruction above saying that they have to review a completed script before deciding whether to offer assistance, which also appears in the earlier versions, is not followed. They have engaged with a number of productions from an early stage in the script development, helping to redraft or even completely rewrite it to suit the military’s needs. For one feature film depicting a prison uprising at Qala-I-Jangi the head of the Army’s ELO John Clearwater attended an ‘initial read through of [the] draft script’. Along similar lines is an entry from the USMC reports on the apparently unmade film Outpost Echo where reports note that they ‘provided scripts notes’ to the screenwriters’ and were meeting with them again to discuss more ideas for development of the film. 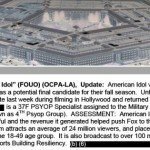 Another entry from 2012 shows that the Army rewrote an episode of America’s Book of Secrets because of ‘rough draft concerns’. The pilot episode of the reboot of Hawaii Five-O involved the Army, Navy, Air Force and Coast Guard, though in exchange they demanded ‘script revisions’. The officer whose name is redacted in the documents who was ‘on-set in Hawaii’ is almost certainly Phil Strub, given how short the redacted name is and how heavily involved the DOD have been in the relaunched series. No doubt he was there to oversee things and make sure everything went according to the script and this wasn’t at all an excuse to visit a beautiful island in the middle of the Pacific. 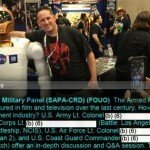 What this shows is that the DOD have an interest in helping to develop scripts from the draft stages, especially for friendly projects that will likely have a lot of good PR value for the military or are the work of trusted partners within the industry. These examples and others in my article on the USMC documents here confirm that this is still taking place, from projects as small as a TV episode on the History Channel to a mega-budget blockbuster like Top Gun 2. That the DOD have enjoyed such an influence over scripts was already known and discussed in books like David Robb’s and Matt Alford’s. While we don’t know the exact nature of the changes and rewrites the DOD are doing on these recent and contemporary entertainment projects, we can be sure that the sort of things detailed in Robb’s and Alford’s work are still going on today. However, it is not just individual films or shows or even individual TV networks that the DOD are pro-actively seeking to engage with on a larger scale and at the earliest stages of production. 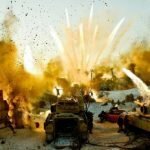 It is the largest agencies and studios in Hollywood that the DOD are targeting as they seek to pre-emptively expand and extend their influence. In 2010 representatives from the US Army met with people at William Morris Endeavor – perhaps the largest talent agency in Hollywood. They were discussing ‘how best to align U.S. Army interests with feature films projects. The goal is to enter studio projects early in the development stages when characters and storylines are most easily shaped to the Army’s benefit’. The most explicit admission in the whole of the US Army reports is regarding two meetings in autumn 2012 with executives at Warner Bros. The documents state that the purpose was to ‘get involved early in the production timeline on potential projects and programs so we can help shape the topics before they are finalized by the studio executives’. 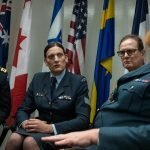 The DOD are not simply trying to shape scripts in the drafting and pre-production phase, they are trying to influence the decisions of corporate executives on which films to green light and which to leave in the stables. This was followed in September 2013 when they met with a senior figure within Sony Pictures Entertainment – Andy Davis, the President of Production Administration at Columbia Pictures to ‘to discuss future projects and ways we can work together on scripted projects in the future.’ Appearances on panels for the Got Your Six Campaign and the Producers Guild of America, as well as meetings with the scripted and unscripted team at TNT and other smaller outfits show just how eager the DOD is to shape productions almost from their conception. Illustrating just how important as-yet-unscripted productions are to the DOD the Office of the Secretary of Defense for Public Affairs has a dedicated unscripted projects officer for reviewing projects that are not yet written. When this role was briefly unfilled in July 2014 it was recorded in their activities reports, though within a matter of weeks someone took over the job temporarily. However, it’s not just a strategy of trying to shape productions even before they have been scripted that marks the DOD moving from the role of a government agency to a corporate body. The documents frequently refer to expected and recorded audience numbers and key demographics, just like a broadcast corporation looking at its own ratings, or a corporate sponsor measuring the effectiveness of its product placement. This is perfectly illustrated by the entry on the US Army’s involvement in an episode of Hawaii Five-O. This mutual promotion activity between the show and the DOD – boosted by being scheduled directly following a major sporting event – had obvious recruitment benefits but also serious propaganda benefits. These nearly 20 million viewers, many between 18 and 49 years old, riled up by watching a major fight and in a state of heightened adrenaline were then shown a story in which a major disaster is relieved by the patriarchal protector figure of the DOD. Even for those who would never sign up to join the military – the vast majority of those watching, that is – this collaboration will have born very useful results for the DOD. Many of the Army’s reports contain comments at the end of each entry about a TV show, film or other request, saying ‘Supports Building Resiliency’ or ‘Supports Transforming the Generating Force and Seeking Efficiencies and Affordability’. Some have suggested these are the DOD’s ratings for the shows, but the way the reports read they strike me as rationales (or excuses) for granting a request for support. A near-full list of things the DOD-entertainment relationship apparently supports is: Building Resiliency, Seeking Efficiencies and Affordability, Maintaining our Combat Edge, Reconstituting the Force, Modernizing the Force, Transforming the Generating Force, Energy Security and Sustainability, Adapting our Institutions, Broaden Understanding and Advocacy, Strength of the Army Family, Build Trust and Confidence, Care of Troops and Families, Image of the Army, Modernization, People are Our Army, Profession of Arms, Soldier for Life, Health of the Force, Meeting the Needs of Our Nation, Nations Force of Decisive Action – Ready Today, April as the Month of the Military Child, Depiction of a Trained and Ready Force, Highlighting Army Accomplishments, Showcasing Army leadership experience and Profession, Army as Force of Decisive Action. Through several inquiries, searches of DOD websites and FOIA requests I managed to establish that these phrases do not appear in any public relations doctrine. That is, they are not terms that are part of the formal instructions given to the ELOs. Some of these ideas do appear in various Army Posture Statements and related documents from this period (2009-2014) but they are not defined, let alone in a public relations context. Thus, I can only conclude that they are meaningless buzzwords. Just like in any major media corporation, or indeed many large organisations of any type, the reasons given for many of the tasks are not the real reasons, but they are linguistic masks, disguises for the real reasons. While some of these phrases do hint at some of the more obvious military preoccupations some of them are management-level doublespeak. This is the only time in the 5 years of reports that the Army mentions the effect that the revenue from a successful show had on its corporate overlord. The corporate overlord in question, Fox, are referred to dozens of times throughout the reports and therefore produced a lot of entertainment with military assistance. As right wing nationalism and militarism go hand in hand this relationship is not a surprise, as such, but provides confirmation that the US military care more about the success of some corporations than others. 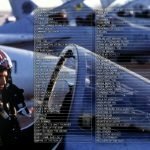 Given that the Pentagon’s budget is larger than the revenue of even the biggest US/multinational corporations and that it employs over a million more people than Walmart then the DOD showing favouritism to some media conglomerates over others has a potentially massive influence on the media landscape in the US (and by extension, the world). This 1-2 knock-out propaganda volley was conceived by the producers at Fox, but it was reviewed and assisted by the Pentagon. As the DOD saw it, ‘Supporting Fox with this information and following up with them to ensure they received the support they needed from our office will help us on future programs where we will need their support.’ That said, if military propaganda must exist then anti-suicide propaganda is about the most benevolent kind I came across in all the thousands of pages of reports. Even though there was no production assistance agreement in place with Bones the DOD agreed to help, reasoning that, ‘Our suicide prevention messages will receive millions of viewers and similar paid advertising cost for that PSA at that time slot would have cost the Army thousands of dollars.’ They also note that the show had future propaganda potential saying that it ‘could serve as an outlet for further Army messages as the character one of their leads is supposed to be a former Soldier’. They bent all the rules for this particular project – having no formal agreement, reviewing the episode as well as helping with the PSA, and even giving away an opportunity to promote the Army over the objections of the entertainment producers. The reason for this – that they didn’t want to risk someone from another branch of the military not calling the helpline number due to it being branded Army-only – is by some distance the most humane thing stated anywhere in these files. The scale of the Pentagon’s operations in the entertainment industry, the sophisticated pro-active nature of their strategy, their expanding influence, the absence of any serious oversight or stated mission – all of this suggests that nothing less than full-spectrum dominance of the entertainment industry will satisfy the Pentagon’s megalomania. They are trying to influence major media executives before the broad topics of forthcoming entertainment products are nailed down, let alone scripts and characters and storylines and settings. That degree of influence goes beyond what any individual producer or executive could expect to wield, and goes beyond that of any small or even medium-sized Hollywood studio. The DOD’s ELOs are like a corporation, but without the tribal limitations of a corporation competing with other corporations. Different parts of the entertainment industry might be designated the turf of different branches of the DOD – projects involving multiple branches always have one designated as the lead – it is perhaps more accurate to compare them to a corporate syndicate, or a mafia, since they do all dress the same and carry guns most of the time. They are attempting a hostile takeover – not just of a particular rival business or section of a market – but of the entire entertainment industry. To a military mind the industry is just more territory to be conquered, seized and subsumed. 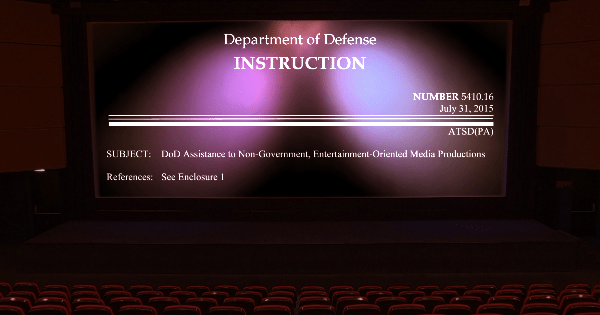 You can download the 2015 version of the DOD’s Instruction 5410.16 on Assistance to Non-Government, Entertainment-Oriented Media Productions here, the US Army Entertainment Liaison Office reports 2010-2015 here and the USMC Entertainment Liaison Office reports 2008-2015 here (all PDF). 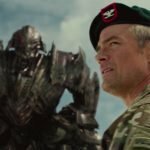 ClandesTime 094 – How Many Films has the Pentagon Supported?